Tour operators/agencies don't work for free. While the operators imply that someone else is paying the freight through discounts, that's simply not true. Someone has to payand that someone is YOU. If you have any doubt about that, see my "Analysis of a Tour Offering" below. Quality accommodations don't have to cost $100-200+ per person per night. That's the typical dollar range for lodging on the package tours. Believe me, you can stay at a quality B & B or guest house for less than $100-200 per person per night. My guidebook and consulting service can direct you to a wide range of choices. Most tee times do not have to be prepaid. Some major courses require 100% prepayment (e.g., Carnoustie, Muirfield, St. Andrews). 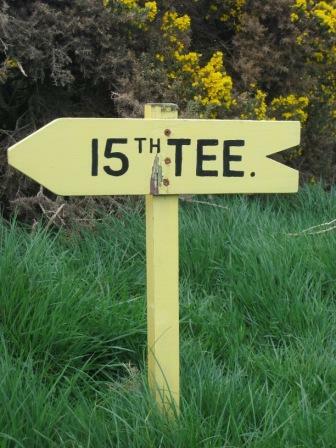 But most courses charge a nonrefundable green fee deposit ranging from about £20-40 or more. Nevertheless, agencies want you to prepay everything. But, what happens if you get sick? or have a sore back? or you want to go to a museum? or it's just too wet for your taste? Prepaid scheduling limits your flexibility and locks you into a schedule dictated by someone elsenamely the tour operator. Your objective should be to maintain as much flexibility as possible and don't pay for anything until you have to. Short-notice booking is easy. Groups of four and up are best advised to pre-book (days or months ahead depending upon the course), BUT on many fine Scottish courses on weekdays a golf party from one to four can play with little or no advance booking. Many times you can even "walk on"yes, even during the "high season" and EVEN as a single golfer at the Old Course in St. Andrews. Remember, Scotland (about the size of Maine) has hundreds of golf courses. There's good golf around virtually every corner. First, the least expensive methods - You will pay only the current fee or green fees (with an Old Course time, St. Andrews requires play on one of their other 18-hole courses; the usual choice is either the New or Jubilee. Costs - 2018: New/Jubilee £80, Castle Course £120, Old Course £180). 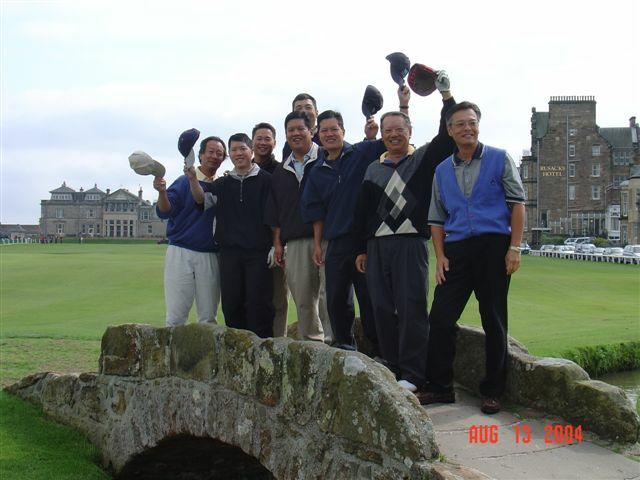 1 The best way to get a tee time at St. Andrews is through the advance reservation process. 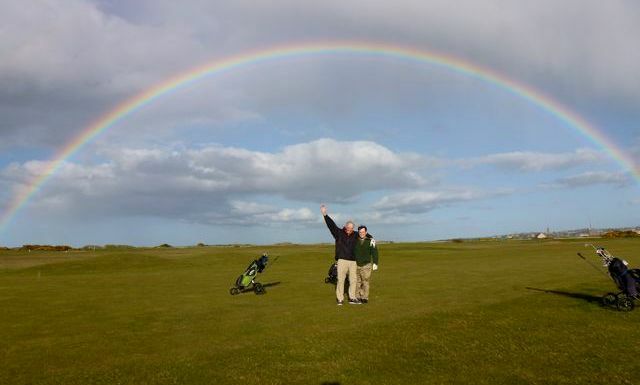 Links Management deals directly with a lead golfer. A tour operator or travel agent cannot do this for you. 2019 - For tee times during high season (mid-April to mid October), reservation requests have been taken already during a fourteen-day period Wednesday, August 22 through September 5, 2018. See "Plan B" below.. ALERT: You cannot play the Old Course if it's not open. Before making a reservation request, check for "Busy Dates" at www.standrews.com. Typically, within a few weeks (late September/early October) you will be notified regarding your success or failure in the advance reservation process. If you are successful you can get on with booking the rest of your trip. If you are not successful, go to "Plan B." 2 "Plan B" - Reapply for an advance reservation in January. When advance reservations are not prepaid by an announced date (typically end of November), those times are released for a second round of applications. No waitlist is kept. Monitor the St. Andrews website for further instruction as this date approaches. If that doesn't work, go to "Plan C". 3 "Plan C" - Schedule a St. Andrews stay in your itinerary and enter the 48-hour daily ballot (two days prior to day of play). About half of all Old Course times are distributed through the daily ballot. Normally, even in high season, if you give the ballot two or three days to work, it would be highly unusual if you did not get an Old Course time. Based on my years of experience, the success rate is 95% in all months except August. This is the least expensive way to get a tee time because no second course is involved. 4 Check in with the Starter when you are in St. Andrews. Whether in the early morning queue or later in the day, you may be able to play as a "walk-on." Due to weather or for other reasons, St. Andrews often has open slots. Obviously, this will work best for singles or twos. Now for the expensive options . . . Any time secured through a third party (i.e., a tour operator or lodging host) will be significantly more expensive. 1 Call a tour operator and tell them you want to buy a "trade time" through them. Hard to say how much this will cost. You can ask for a trade time any time, but they go fast - not much chance after January. The time will virtually always be wrapped into an expensive package tour. This is the main source of all those "guaranteed tee times" advertised by the tour operators. The times are date-specificthat is, they are "guaranteed," but they are only available to you if you can travel when the seller wants you to travel. 2 Certain hotels, guest houses, and B & Bs are allocated some tee times. You can inquire via www.stayinstandrews.com, but as a practical matter, these are usually sold on to major tour operators who, in turn, package them up with minimum stays, dinners, and other requirementsall at a premium price, of course. This is the other main source of all those "guaranteed tee times." The following remarks and analysis are directed particularly at trips to Scotland where little discounting occurs in the travel industry. In Ireland there is a more established pattern of discounting for operators at golf courses and at some lodgings. But, whether it's Scotland or Ireland, the principle is the same: operator profit is HUGE by any standard. I have analyzed dozens of tour offerings to both Scotland and Ireland and have arrived at the following guidelinethe most important sentence in this website: Tour operators typically mark up their "product" by a factor of fifty to one hundred percent or more. In their colorful brochures and expensive advertisementsall couched in romantic languagetour operators are good at implying that you're getting a retail package at a wholesale price. But here's the truth: (1) most golf courses in Scotland don't offer discounts to tour operators; (2) rental car agencies don't give serious discounts to anyone; and (3) only a handful of hotels (e.g., Turnberry, Gleneagles, St. Andrews' Old Course Hotel) pay commissions or grant operator discounts. And, even if a hotel discounts bookings, what good does that do you, the traveler, if the tour operator just pockets the difference between the discounted rate and the advertised public rate?and, believe me, it happens all the time. If you can get a handle on each of these elements, analyzing real tour costs becomes easy. First, a benchmark for your trip: You can have a first-rate trip to Scotland or Ireland for $300 to $350 per day all inclusive of golf, transportation, and lodging. It can be more or less. Remember: how much you pay depends upon where you stay and where you play. Let's take a look at a proposal from a company selling a "guaranteed tee time" on St. Andrews' Old Courseprobably a date-specific "trade time" purchased from the Old Course Experience. The culprit shall go unnamed, but here are the details. Note - August 2017: This trip was analyzed in 2010 when the exchange rate was $1.70 = £1. Today the actual cost of this trip would be nearly 25% lower than in 2010. Now, here's the actual cost of this package (exchange rate: £1 = $1.70). All costs per person. Comment: In all my years of analyzing tour offerings, this is one of the most egregious "rip-offs" I have found. But then someone has to pay for that office on Fifth Avenue in New York City, right?just make sure it's not you. I know what I'm talking about. I know the rates at the hotels and B & Bs. I know exactly what it costs to rent a minivan. The bottom line? Buying a golf trip at an "all inclusive" pricewithout knowing the cost componentsis just like buying a "pig in a poke." The Lesson of this Story: you can achieve incredible savings by learning the ins and outs of golf in Scotland from Ferguson Golf. A golfer and a non-golfer could take a trip identical to the one described above for about $3,700 less than the advertised price. Just think what a foursome of golfers could save! In this case, four couples (for example, 4 golfers, 4 non-golfers) could save $12,000 to $14,000 by booking this trip themselves or with the help of Ferguson Golf!! If I can provide you with this kind of information, doesn't my modest consulting fee look like the real good deal? If you think this is just a rare, isolated example, give me a call at 1-303-722-3441 and ask for an analysis of a tour you are considering ($60 "twilight" rate).